Awhile back, as I was perusing my Facebook newsfeed, I came across a picture of a friend wearing his half marathon medal at work. At first, I felt confused. I knew he had run a half marathon, but that was in February and this was August. I couldn’t help myself. I had to ask him what on earth he was doing wearing his medal to work 6 months later. Being new to running, he had never heard of race medal-wearing etiquette and thought wearing his medal to his class reunion (yes, he did this), nights out on the town (did that too), and even to work occasionally were cool. Whoa. This boy needed an intervention! 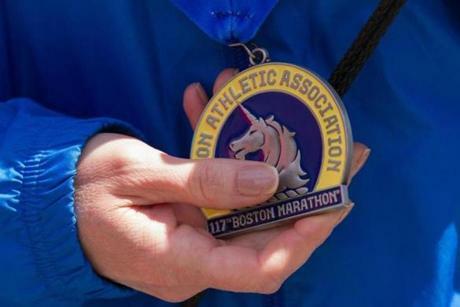 So, what’s okay and what’s not when it comes to wearing the race medal? Here are a few basic guidelines based on group discussions on the matter and personal opinion. 1. Wearing your medal on race day. This one gets a thumbs up! 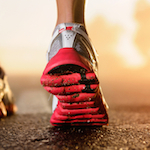 You likely trained for months to get to race day, logging miles and avoiding injury. You earned that medal. Wearing it around on race day, even into the evening, is a very acceptable and even expected tradition, especially of marathon runners. I know for myself when out to dinner after a marathon, I enjoy looking around and seeing medals around the necks of runners who endured the same thing I just did. There is a certain camaraderie involved and it’s nice to connect with other runners this way. 3. Wearing your medal any other day after race day. No. No. No. And, there are really no viable exceptions to this rule. Unless you medaled in the Olympics and are being interviewed by a national news affiliate, wearing your medal on any other day after race day is simply not okay. Invest in a great looking medal holder and display it at home. Ashleigh has been a race director for five years as owner of Starlit Running Co., LLC. 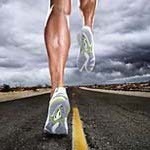 She is also an experienced copywriter and author of articles about running and race directing. Ashleigh earned her B.S. in Nursing from Missouri Southern State University. Ashleigh has competed in over 15 marathons, including three Boston Marathons (2006, 2013, 2014).